Looking to rid your yard of weeds? Check out these weed wackers, which offer impressive functionality at a reasonable price. If your lawn features a lot of “interruptions”—trees, shrubbery, pavers, and pathways—odds are that you struggle with a bulky lawnmower to maneuver some of the landscaping highlights. A perfect landscaping complement to a lawn mower, the weed wacker tackles overgrown grass in hard-to-mow areas. This lawn tool, also called a “weed eater” or “string trimmer,” uses a monofilament line (a strong, flexible line made of a single fiber of plastic) rather than a blade to do just what its name implies: whack weeds. To make sure that you’re selecting the best weed wacker for your yard, start by getting a grasp on the model variations available. The fuel source you need often depends on the size of the yard and how long the weed wacker would need to run to get the job done. That said, you’ll also need to think about what a battery or a tank of fuel adds to the overall weight of the machine. Gas-powered weed wackers are powerful and untethered, giving users the freedom to move about the yard without extension cords. As exhaust emissions become a greater concern than ever before, some manufacturers have introduced gas-powered models that create less pollution without sacrificing performance. If you’re interested in buying a more environmentally friendly gas-powered weed wacker, look for the words “low emission” on the packaging. While these weed wackers can handle long weeds better than their electric-powered counterparts, but they’re also more expensive. They’re heavier as well, with many models weighing in at just under 13 pounds. Electric-powered weed wackers tend to be even more lightweight and functional, whether a consumer chooses one with a rechargeable battery or a good old-fashioned cord. Corded versions occasionally pose problems maneuvering around a property, since the cord can get tangled or run out of length, but they’re also the most budget-friendly option. Cordless versions, on the other hand, are extremely portable and easy to maneuver, but their battery (or batteries) must be recharged between each use and they don’t perform as well as corded models in tall grasses. That said, recent technological improvements have aided corded and cordless electric weed wackers in catching up with their gas-powered counterparts in terms of performance. Whether or not you need a tool with wheels depends largely on the type of terrain you’ll encounter on your property. A wheeled weed wacker, sometimes called a “walk-behind,” ideal for handling large patches of rough terrain, thanks to the maneuverability provided by the wheels and typically wider cutting paths. A majority of these machines operate on a gas-powered engine similar to a lawnmower’s and run on two or four wheels. A weed wacker without wheels, though, is far more common and generally effective on even the messiest tangles of grass. Unless you live on a property with extensive weeds and rough terrain, you can likely make do with a model without wheels. The bodies of weed whackers come in two shapes: curved shaft and straight shaft. Curved shaft weed wackers feature a bend at the end of the shaft, near the blades, that makes them shorter in length and—combined with a lighter weight—more comfortable to use. These weed wackers work best for homeowners who need to manage grass and plant growth around (but not underneath) trees and other objects, since their design won’t quite fit into hard-to-reach places. Narrow straight shaft weed wackers boast a greater reach for tall users and those who need to trim far beneath shrubbery or unique landscape features, but they tend to be tougher to use due to their heavy weight and high level of vibration. Most popular weed whackers range in weight from five to 15 pounds. Corded, curved-shaft models are typically the lightest, while gas-powered walk-behinds are the heaviest. Additionally, most weed wackers have cutting path diameters somewhere between 12 and 17 inches. After thoroughly comparing reviews from consumers and publishers alike, we’ve rounded up the most highly rated weed wackers available today to help you find one that fits your home’s needs and your household budget. Check out the best weed wackers below to cut your weed problem—and the shopping trip for solutions—short. This model operates on high-efficient lithium-ion batteries and a brushless motor, eliminating exhaust fumes and excessive noise without sacrificing any of the power. Plus, you don’t have to worry about plugging it in and tripping over a long cord. Its light weight (only 9 pounds), extendable aluminum shaft, and the 15-inch cutting swath it easy to maneuver. And those who put the EGO Power+ trimmer to work in their own yards agree, giving it 4.3 out of 5 stars on Amazon. The trimmer comes with a 5-year warranty, and the battery has a 3-year warranty. A gas trimmer offers extra power with zero cords, good for large yards which take a considerable amount of work out of the range of an electrical outlet. 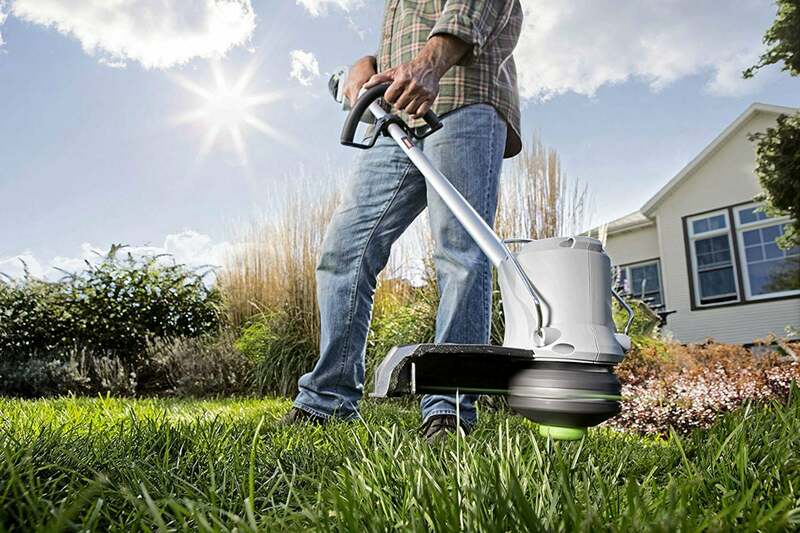 PowerSmart claims that its weed wacker “runs cleaner and produces less noise,” due to its highly-efficient 4-stroke engine, which doesn’t mix gas and oil to create combustion. 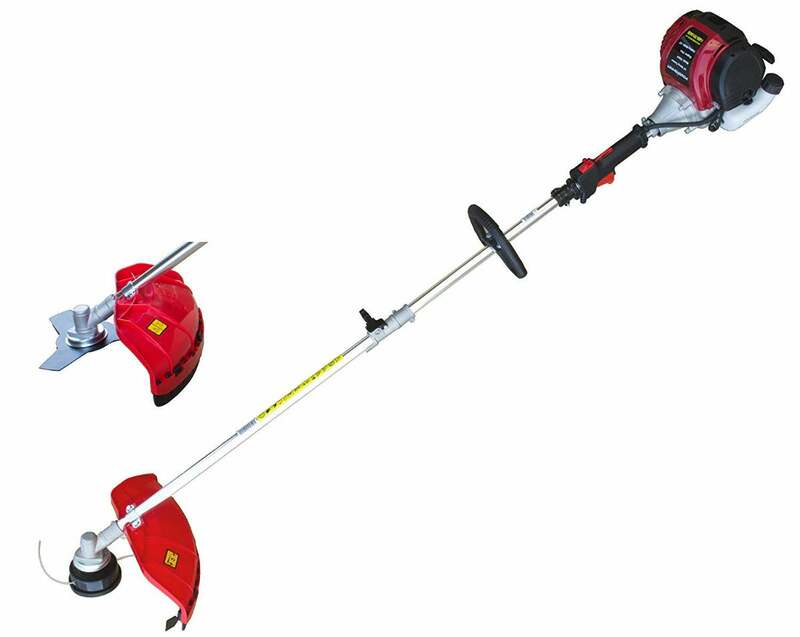 This model weighs in at a sturdy 25 pounds and features a long, straight shaft, making it an excellent choice for trimming hard-to-reach areas. Amazon customers are uniformly happy, giving it a solid 5 stars for its “smooth and powerful” handling. This trimmer is protected by a 2-year limited warranty. 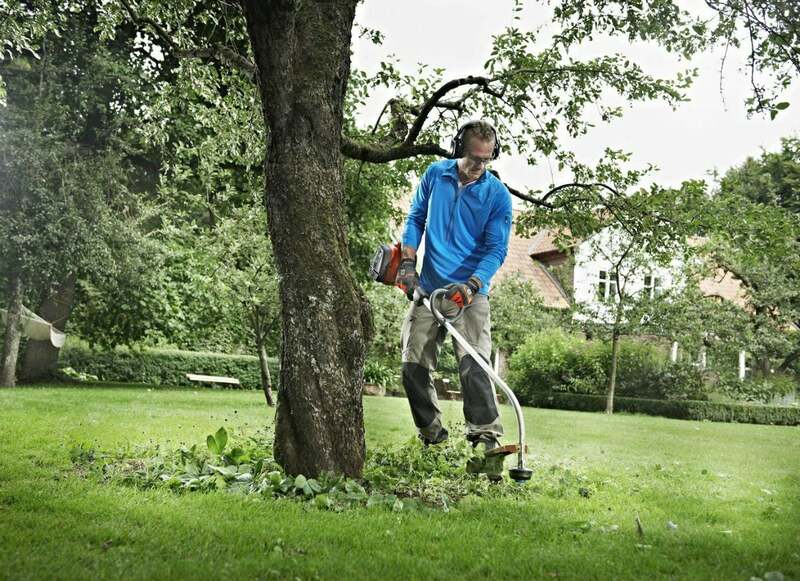 The Husqvarna gas trimmer, which features the easy handling that comes with curved shaft trimmers, also boasts a 2-stroke gas engine designed for professional as well as personal use. At 10 pounds, the Husqvarna is a good mid-size model, and its ergonomic shaft design helps with posture and handling. Bonus features include automatic “smart” controls for easy starting and stopping. Amazon customers rate this 4 out of 5 stars, giving high marks for these easy start mechanism and high-performance with weeds. 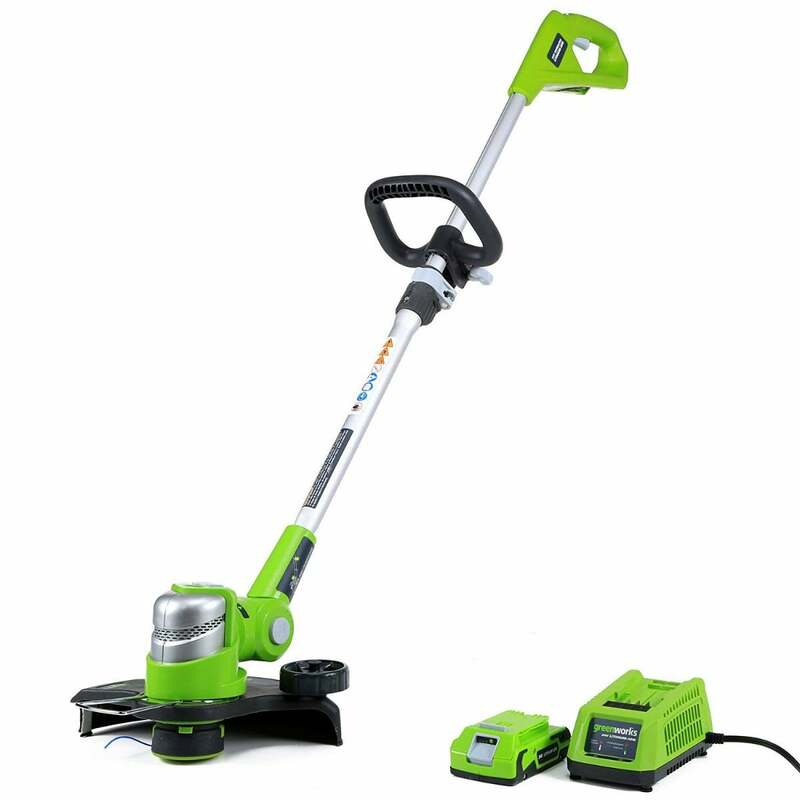 If you use a trimmer occasionally or have a small garden, consider this excellent, less expensive choice. 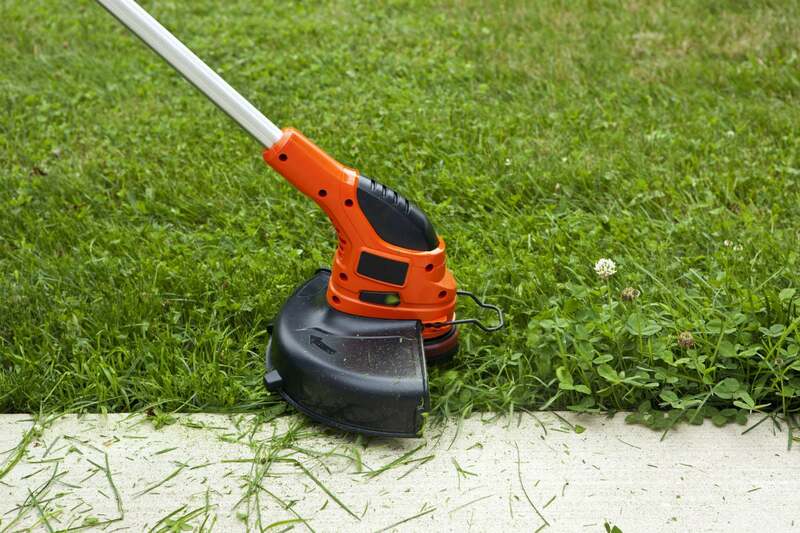 As a bonus, BLACK+DECKER’s 14-inch straight-shaft electric trimmer also converts into an edger for extra precision. The electric cord has an automatic feed spool, which can be extended or retracted as needed. With 6.25 amps of power and a smooth transmission system, this adjustable height trimmer is also light-weight—only 7 pounds. Customers rate it an average 3.9-star rating on Amazon, lauding it as “inexpensive but not cheap.” It comes with a limited 2-year warranty. If you prefer electric power but don’t enjoy being tethered by a cord, try this Worx cordless model to cut out gas emissions. Even with the battery (which is included, along with a charger), this power tool weighs in at a little more than 8 pounds. Using durable lithium-ion battery technology, Worx product specs are on the cutting edge (literally). This cordless model converts into an edger with its three-position pivoting head—and it works like a charm, too, according to Amazon customers, who give it 3.9 stars. Be aware that the battery takes five hours to charge fully to provide up 25 minutes of full-power runtime. Contact the manufacturer for warranty details. 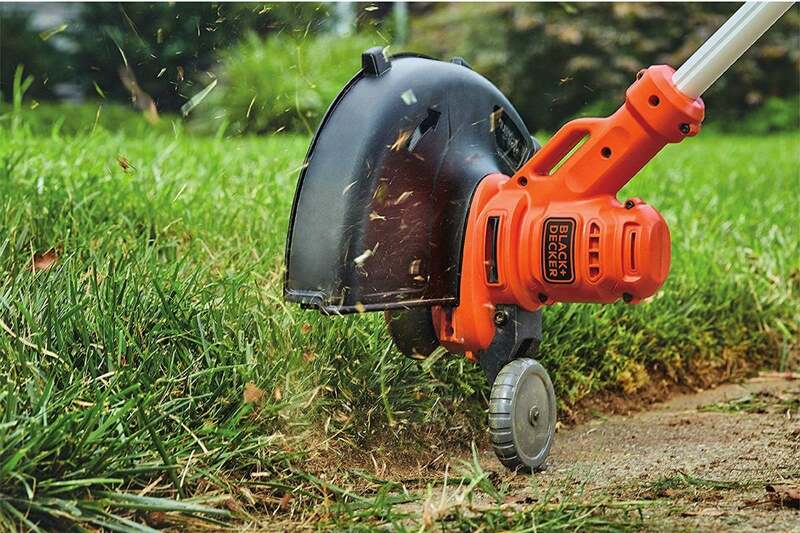 This gas-powered trimmer doubles as a mini lawn mower—two tools for the price of one! 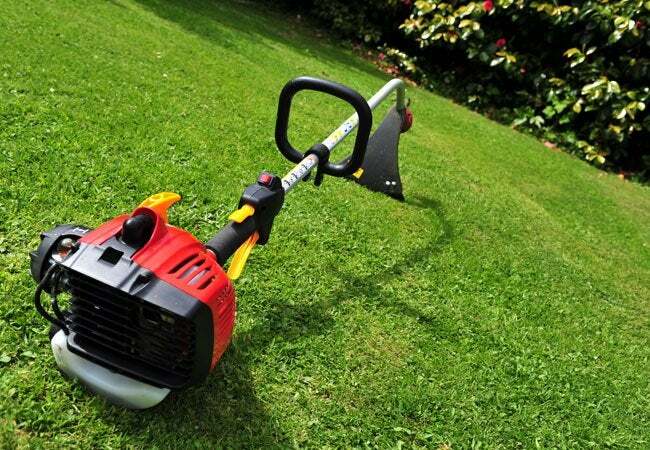 The powerful 2-stroke engine is air-cooled, so it won’t overheat, making it ideal for large lawns and fields. 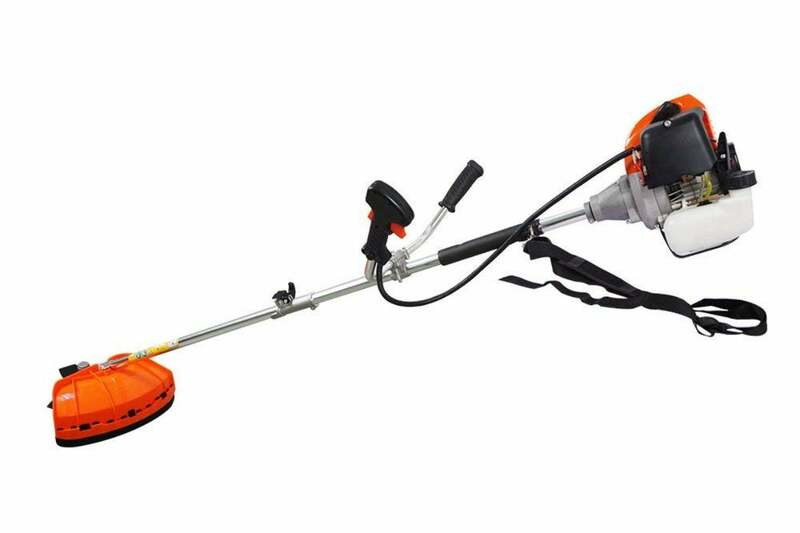 It also weighs only 12 pounds, which is light for gas trimmers. Other special design features on the 3.3-star power tool include an anti-vibration system and shoulder strap to cut down on fatigue. Contact the manufacturer for warranty details.